This book fulfils an urgent need for an updated text on pediatric psychopharmacology. It takes a unique approach in discussing recent findings within the context of current issues, including economic and political ones. The book covers the emerging question of treating children who do not yet meet diagnostic criteria for psychosis, e.g, schizophrenia or bipolar disorder, but who are deemed to be at high risk. This is an active area of debate: such children are being treated in certain centers, while others reject this completely. The book addresses the antidepressant controversy, the placebo response and unique strategies for delineating this, and ways to optimize the differential between active medication and placebo. It reviews the impact of recent American Heart Association guidelines for monitoring children on stimulants and other psychotropics. It adheres closely to DSM-IV diagnostic criteria throughout. The book describes the use of newly approved drugs such as Lexapro for treating adolescent depression and the novel compound Intuniv. It covers the TADS and CAMS studies, which evaluated the use of SSRIs alone and in combination with cognitive behavioral therapy for adolescent depression. Other topics include treatment of bipolar disorders, the increasing popularity of generic equivalents, combination pharmacotherapy and the potential dangers of psychotropic medications. 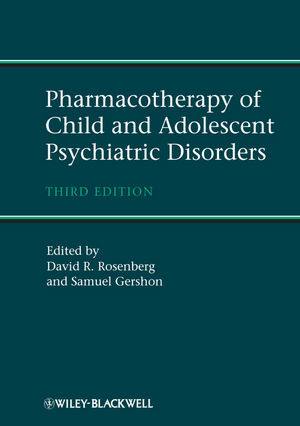 Third edition of the first ever book published on pediatric psychopharmacology from renowned editors. Incorporates current developments with regard to SSRIs, their indications and their safety issues, including possible associated suicidal behavior. Addresses concerns about cardiovascular side effects of the new stimulant medications available, and compares to other FDA-approved medications for ADHD. Features many tables, figures and pictorials, making it highly accessible and reader friendly.